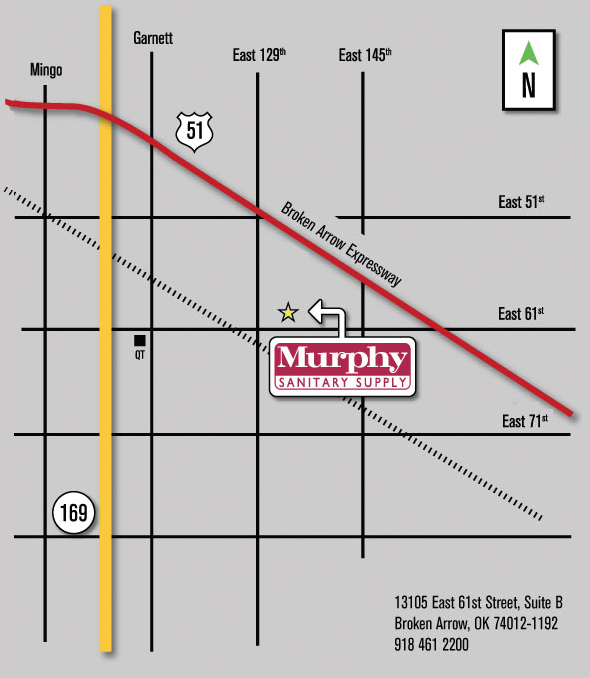 Murphy Sanitary Supply is located in Metro East Building IV close to 61st Street and 129th East Avenue intersection. Take 61st Street exit. Go east through the traffic light at 129th East Avenue (approximately 1.5 miles). Upon crossing the railroad tracks, Murphy is in the first building to your left (north side of 61st Street). The building is gray with two maroon stripes around the top and diamond windows. The building faces east. You will see the dock side of the building first (west). The black Murphy awning is over the west walk in entrance. To enter the main entrance, continue on 61st Street to the East side of the building and take a left into the parking lot. Go north through the parking lot to Suite B. A small swinging sign New Home of Murphy Sanitary Supply identifies the entrance.